Click on the Desktop at Start Menu to go to the Desktop. 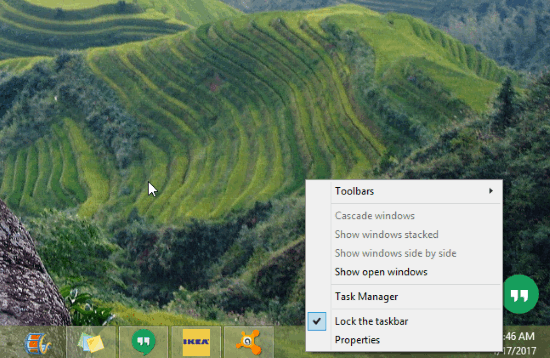 At Desktop, Right-Click on the Taskbar, then click on properties option. As you click on the properties option on the Taskbar, a window named “Taskbar and Navigation Properties” opens in front of you. In the window, you will find four tabs. Among these tabs, go to the “Navigation tab“. At the Navigation tab, enable the option “When I sign in or close all apps on the screen, go to the desktop instead of start“. Congratulations! 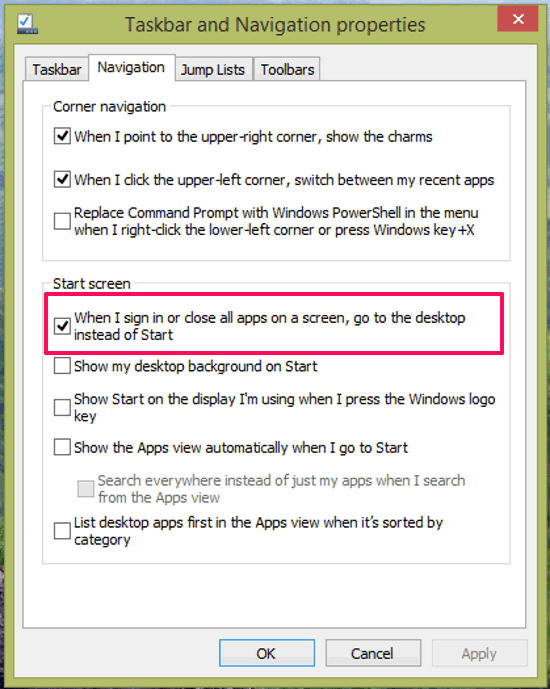 You have set Desktop as default in Windows 8 in just two simple steps. The above-written steps are the simplest steps to boot your PC to the desktop instead of the start screen. However, you can try another method to bypass the start screen in Windows 8 and Windows 8.1. 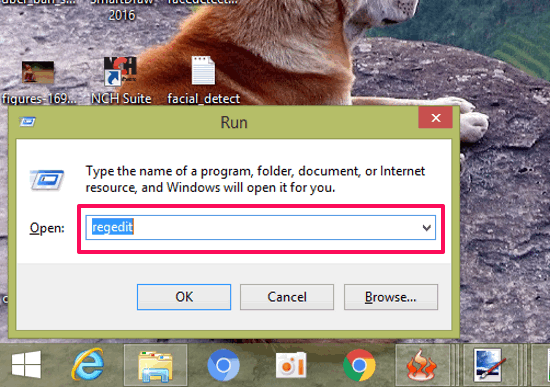 Press Windows + R keys to execute the run command, then type regedit in run window and press OK button. Note: You will be guided to make changes to Windows’ Registry in the following part. Be extra careful while handling registry. If you mistakenly make changes to Registry, it might cause fatal errors. In the Regedit window, go to HKEY_LOCAL_MACHINE > SOFTWARE > Microsoft > Windows > CurrentVersion > Explorer > StartPage. In short, you have to open the directory – HKEY_LOCAL_MACHINE\Software\Microsoft\Windows\CurrentVersion\Explorer\StartPage. Here you’ll see a key named – OpenAtLogon on the right-hand side. Right click on the OpenAtLogon and hit Modify option and change the value to zero, then press OK. 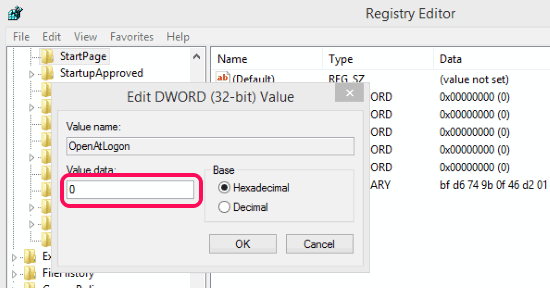 If OpenAtLogon option is not available there, then right click on the free space on that window, then click on New, then click on DWORD (32-bit) Value to create a new folder and give it a name: OpenAtLogon. Now close all the open windows and restart your computer. When you log into Windows 8, the Start Screen will automatically switch to the desktop. That’s all about how to bypass the Start Screen in Windows 8 and 8.1 computers. This is how simple is to boot to Desktop instead of Start Screen in Windows 8 and 8.1 computers. Choose any one of the above methods that you like. Bypassing the Start Screen in Windows 8 and 8.1 has now become easier. By following some simple steps as explained above, anyone can set the desktop as default instead of Start Screen in Windows 8 and 8.1.